Bake the No Name® Chicken breasts according to the package directions. Meanwhile, slice the bread loaf in half lengthwise and place cut side up on another baking sheet. 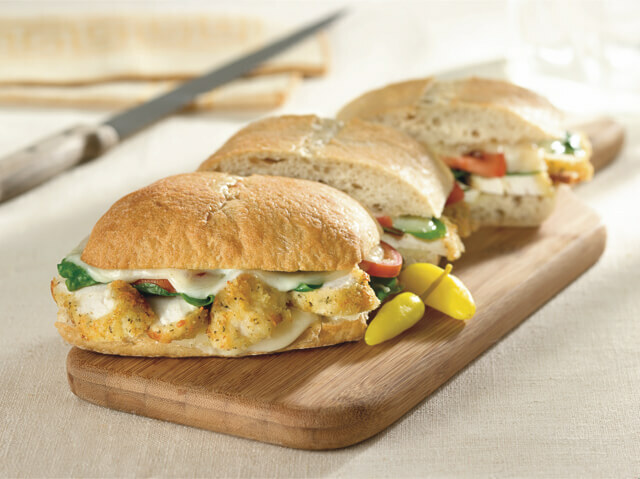 Drizzle each side with Italian dressing and place 3 slices of provolone cheese on each half. Add the cheese-topped bread to the oven for the last 5 minutes of the chicken baking time until the cheese melts. Remove chicken and bread from the oven, and slice each chicken breast into ¼ inch slices. Top the bread with the chicken. Put top on sandwich and cut into 4 portions. Serve with warmed marinara sauce, if desired for dunking the sandwich. Pecan Crusted Chicken with cranberry relish, baby field greens, No Name® bacon, sliced red onion and bleu cheese crumbles.